Designed for the EOS-1D X Mark II, the LP-E19 is a high-capacity (2750 mAh) lithium-ion battery p, offering approximately 10% larger capacity than the LP-E4N. Immense power. Phenomenal speed. A remarkable combination of innovation and refinement. The new EOS-1D X Mark II camera is nothing but legendary every step of the way. Building on a heritage of sophisticated innovation, the EOS-1D X Mark II is blazingly fast. Up to 14 fps (up to 16 fps in Live View mode) can be captured at a burst rate of up to 170 RAWs with a CFast card, and an improved 61-point AF system helps deliver clean, sharp images quickly, even in dim light. This remarkable speed means faster recording too: 4K video can be recorded at up to 60 fps with smooth AF and strikingly clear detail. Combined with superb low-light performance thanks to its powerful sensor and expandable ISO range, the EOS-1D X Mark II performs brilliantly, swiftly and stunningly no matter when or where the photographer is shooting. From the stadium, safari or studio to virtually everywhere in between, the EOS-1D X Mark II maintains and enhances all the hallmarks of what Canon has to offer, marking a new page in the legacy of the EOS series of cameras. Delivering outstanding performance at speeds of up to 14 fps, and up to 16 fps in Live View, the EOS-1D X Mark II camera is loaded with technologies that help facilitate speedy operation at every step of image capture. The EOS-1D X Mark II features a new mirror mechanism designed for highly precise operation with reduced vibration even at incredibly fast speeds. The shutter unit is rated for 400,000 frames and captures at up to 16 fps, while the CMOS sensor has high-speed signal reading that enables speedy image capture. A fast AF/AE system, Dual DIGIC 6+ Image Processors and high-speed recording with its new CFast card slot helps ensure that camera operations are performed quickly and precisely. Key to the performance benchmarks achieved by the EOS-1D X Mark II camera, Dual DIGIC 6+ Image Processors not only convert the light that passes through the camera's sensor into high-quality photos and movies, but also enhance the camera's overall performance. Improvements include high-speed processing, up to 16-fps operation for stills and 4K/60p movies, lens distortion and diffraction correction during operation with virtually no effect on the camera's speed, plus fast write times and much more. Continuous shooting speed may vary based on the aperture and lens being used and conditions of the subject. The EOS-1D X Mark II camera can capture an incredible amount of images and movies with amazing speed. When recording to CFast 2.0 cards through its new CFast card slot, the EOS-1D X Mark II can record up to 170 full-size RAW files, and JPEGs up to full card capacity at 16 fps. 4K/60p and Full HD/120p video can also be recorded with virtually no restriction, and with exFAT format support, movie files of larger than 4GB can be recorded without the need to merge files. Performance with CF cards through the camera's CF card slot is impressive as well: the EOS-1D X Mark II can capture up to 73 full-size RAW files and JPEGs up to full card capacity when recording to CF UDMA7 media. Proper operation cannot be guaranteed for all recording media. Long-term usage may reduce a CFast card's write speed. We recommend users regularly fully format and refresh their card using the "Full Format and Refresh Tool." The EOS-1D X Mark II camera incorporates a number of significant improvements to help deliver highly precise, reliable AF and AF tracking, both faster and available in more situations. It features a new 61-point High Density Reticular AF II system with 41 cross-type points that expands the AF area approximately 8.6% in the top and bottom of the central AF area, and approximately 24% at the top and bottom of the peripheral frame. A wider subject tracking area improves the AF system so that challenging focus tracking in scenes with sudden changes of speed and subject position is easier than ever. The AF system's low-intensity limit has been improved to EV -3 and all 61 AF points are compatible down to f/8 for excellent low-light performance. The EOS-1D X Mark II's AF algorithm has also been improved: it's equipped with AI Servo AF III+, which remembers the AF path and helps refine precision. 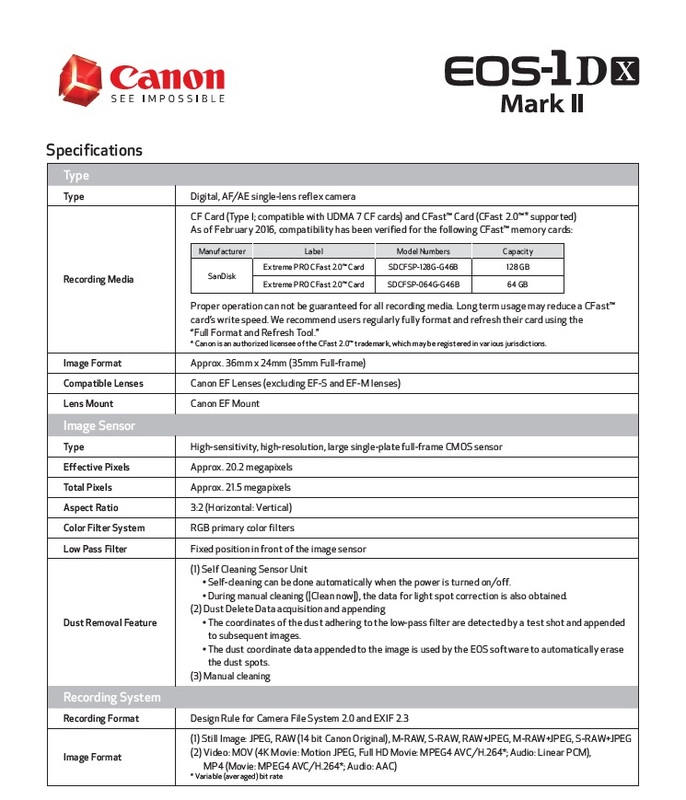 Whether choosing individual AF points manually, using the Large Zone AF area or any of the camera's automatic AF selection modes, the EOS-1D X Mark II is designed to exceed users' expectations for high-precision AF. The EOS-1D X Mark II is an incredibly capable camera for moviemaking. Thanks to its Dual DIGIC 6+ Image Processors and its advanced sensor, it can capture huge 4K (Motion JPEG) video at up to 60 fps, recording smoothly to CFast cards. It's the first EOS camera able to record Full HD video at 120 fps, easily displaying minute details imperceptible to the human eye and ideal for slow-motion video capture. With the camera's new touch panel display, AF points can be easily selected while the camera's rolling, and focus can be quickly confirmed with the EOS-1D X Mark II's 4K still frame grab feature, wherein an 8.8-Megapixel still image can be selected for review and saved. Low-light performance is improved as well, with video recording at ISOs of up to 12800 in 4K and 25600 in Full HD. The EOS-1D X Mark II also features uncompressed HDMI output for Full HD videos, helping to facilitate video editing with minimal image degradation. Not to mention, it can also save videos as MP4s for easy playback on mobile devices. Providing crucial location and time data, GPS has become an indispensible aspect of the professional workflow, especially for professionals who work on location and capture thousands of images each day. The EOS-1D X Mark II camera has GPS built in, helping photographers and filmmakers not only tag their images with critical location data, but also adjust the time and timestamp on the camera automatically. Thanks to built-in GPS, and Wi-Fi connectivity through the optional Wireless File Transmitter WFT-E8A accessory, the EOS-1D X Mark II can use both GPS and WFT (Wireless File Transfer) together, making it easy to upload a great amount of images both quickly and from increasingly far-flung locales. Offering compatibility with American GPS satellites, Russian GLONASS satellites and Japanese quasi-zenith satellites Michibiki, the EOS-1D X Mark II's GPS information is reliably accurate virtually anywhere you go. 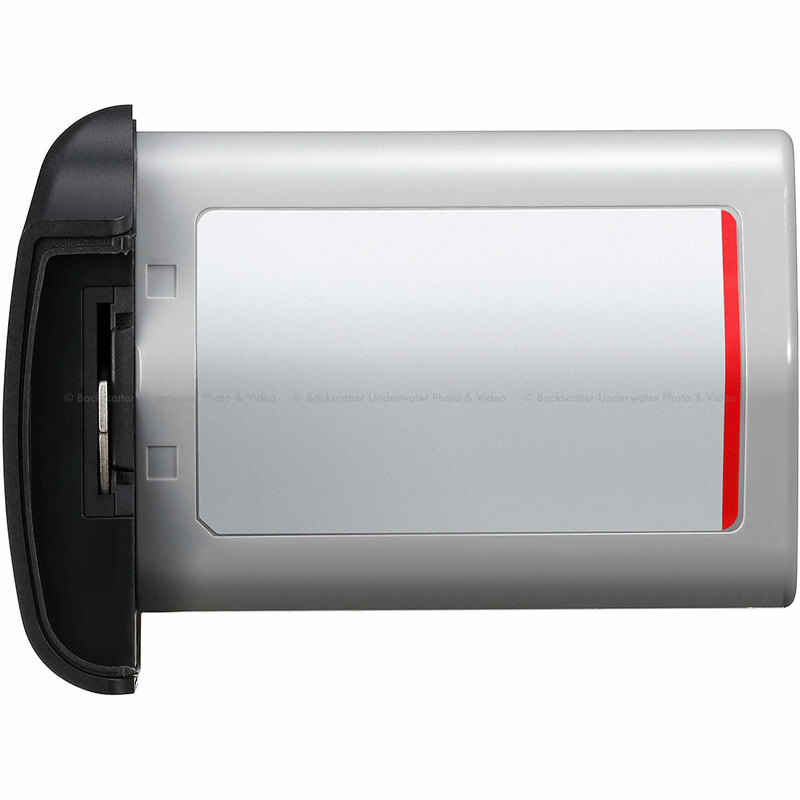 The Wireless File Transmitter WFT-E8A, the EOS-1D X Mark II camera's new optional accessory, provides both a fast throughput for image uploading and several new features that make dynamic wireless photography simple and fast. It has 5 GHz 802.11ac support for high-speed image transfer, a revamped user interface that enables speedy set-up and configuration of wireless networks and even compatible smartphone connection. Accommodating both iOS and Android devices, the Wireless File Transmitter WFT-E8A makes it simple to use a smartphone as a remote control for still and video capture. It can even transfer recorded images back for viewing on the device's screen. The Wireless File Transmitter WFT-E8A is both compact and durable, with excellent dust- and water- resistance for unfettered operation in difficult environments.